Had I acted upon this desire in my youth, my mother would have literally scalded me with words no young lady should be privy to (and thankfully I never confessed to being a lady), compliments of growing up with my father, to which I am eternally grateful for. But mom on the other hand, watched me like a hawk, scalded me like the devil. The joys of having a strict parent and so one quickly discovered what teenage actions could be indulged in unbeknownst to a parent and what actions I should never even dare contemplate, or suffer the wrath. Granted I wasn’t the easiest of teenage girls and didn’t make anything easy on my mom, and deserved most punishments that came my way. But I take my hat off to her for coping with all the grief I bestowed upon her during those years. Yes, those who knew me, don’t let this angelic face fool you, beneath this good exterior lurked a rebellious, mischievous, curious and adventurous teenage girl up to no good. A tattoo was one of those ‘wish list’ desires during my youth, but knew mom would never consent and so took liberties elsewhere. In hindsight, I am somewhat thankful for once in my life having a strict parent. Seriously, what do we know at age 14, 15, 16 even 17. Oh, yes we think we know it all, but as you grow up and grow older, those rose coloured glasses are removed and you shake your head in dismay at the stupid things you attempted whilst young. No doubt, had I gotten that tatto, it goes without saying this would not have been the mature decision and more than likely would have resulted in emblazoning my skin with some idiotic design that I’d live to regret for the remainder of my natural life. And for want of a better word, said design would probably have been something, boring or typically the ‘in’ thing at the time, dare I say it; a butterfly, a heart, a few stars or something along those lines that you see on every Sarah, Rachel and Jane. So unimaginative. Fast forward another 10 years or so and I’m all grown up and this secret desire for a tattoo lives on. And so several years into marriage, I drop a subtle hint of tattoos to gage Michael’s reaction. Not too enthusiastic. I let it drop. Weeks or maybe it was months later, no longer hinting, I confess to always having had the longing for a tattoo. Still not enthusiastic and so being the good wife that I was in always compromising – albeit too many times during the course of that marriage. Nonetheless, not wanting to do something to displease him, I let it drop. I always knew I wanted a design on the inside of my left wrist. Why? This I cannot answer with certainty. Except to know that I didn’t want it somewhere common or somewhere that was immediately visible to the eye. Step 1; Location – check. Step 2; Design – check. Whist it was clear, husband at the time did not particularly endorse this, it did not stop me from perusing online sites for a design for months before and after. Whilst I wasn’t going to actually utilise it, I still wanted to find the perfect design that I could keep hidden on my hard drive and tucked away in my mind that I could fantasize about for months, years after. My little secret. And locate it, I did. Granted I had no idea what I was actually looking for, but I was absolutely certain I would know it when I saw it. And yes I did. Classified under Flower Tattoos and titled ‘Whispering-Leaf-Tattoo. And wasting no time purchasing the design, downloading it with excitement brimming in my chest, but sad at the thought that it would only ever reside on my hard drive. Nonetheless, increments of satisfaction is always better than none. About a year post divorce, I decided to finally do something for me and get that damn tattoo I’ve been wanting since school. My only dilemma was the needle – a phobia for needles definitely has a way of rearing its ugly head in preventing one from acting upon certain wants and desires such as donating blood, getting a tattoo/s. Whilst I was happy to realize that I still wanted the design in the same location and years later, my Whispering Leaf was indeed whispering great things to me. My fear of the needle to embed my little ink was almost enough to make me chicken out. And so spent the next few days playing a game of tennis with good angel, bad angel. And finally decided f*! ?# it! I’m a grown adult for crying out loud, I can do this. And on the morning of my appointment, I stocked up on some liquid courage, a nice big dose of whiskey, a little breakfast, some pain tablets and hit the parlour. Upon arrival, the first thing I’m asked is ‘have you had breakfast’. I smile and say ‘of course yes. A hearty strong breakfast, so I’m good to go’. So five years on and I have not tired of my leaf yet, so I take that as a good sign and up until now I’ve never had the desire to further permanently ink myself, but recently that little itch has taken residence in my mind and I’ve gone so far as to starting the search again for my next piece of art. 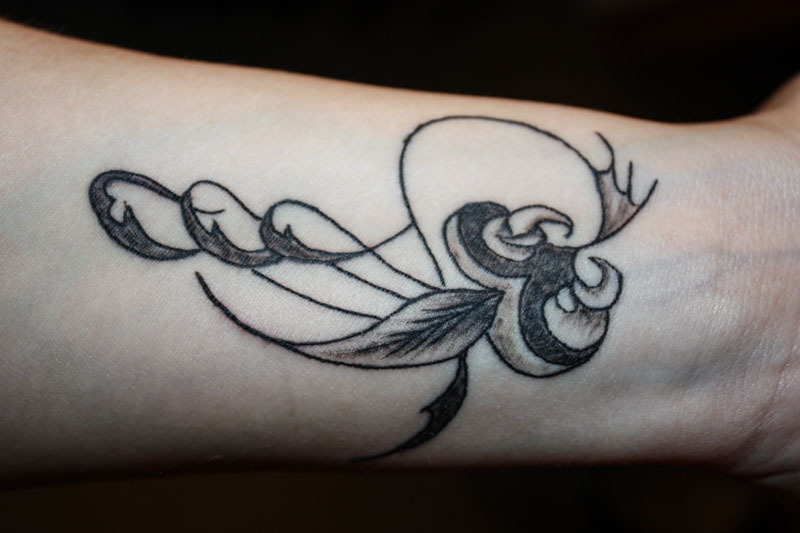 I’ve had that same desire for a tattoo for many years, and have been close to doing it – but that fear of needles has held me back. Despite the comments from those who have inked themselves that the process isn’t “that” bad, I’ve never been able to do it. As I’m approaching 60 next year, maybe that will be the time to do it. I know where I want to have it, so location is fine. I have an idea of that tattoo itself, but need to get a little more serious in that regard. So who knows – in a year’s time it’ll be close to deciding one way or the other. Kim. I can definitely confirm, it’s certainly not a walk in the park, given I have a fear of needles too and it took me a few years to get the courage to do this. But happy I did.